A little over a year ago I used to live in Essendon, more specifically I used to live in Berry St. Essendon, just off Keilor Road, across the road from the McDonalds (If you drive down Berry Street and see the building that used to be a church but is now apartments? That's where I was). 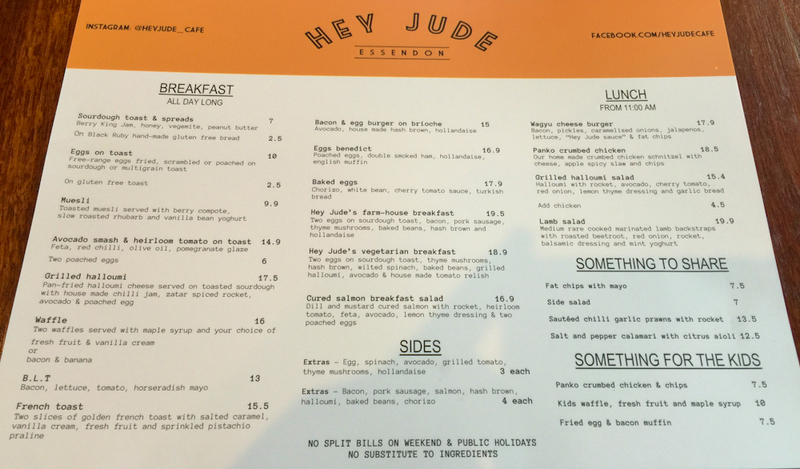 A couple of months after moving in a new building next door went up, and on the corner opened a little cafe called Hey Jude. It was very exciting, as now I had more options for dinner that were walking distance besides McDonalds and KFC - Don't get me wrong, those fast food joints were a godsend on hungover Sunday mornings, but the new cafe on the corner quickly became our go-to breakfast spot. Then, as I said, early last year we moved out, and Hey Jude was no longer our local (We didn't go far, still only a 5 minute drive). I can't articulate why, but it felt weird going back - like we were cheating on our new house with an ex, so for the longest time we gave Hey Jude a miss. Saturday morning rolls around and it's a lovely day. The sun is shining, birds are chirping, and more importantly I've got a bucks party to go to and need some fuel in my stomach for the 12 hour drinkathon that awaits me in the afternoon - We weigh up our options and decide to give Hey Jude another crack. We arrived at around 7:30 to an already bustling cafe - The early risers are out in force and Hey Jude is already filling up. We took a seat by the window, ordered some coffee's and grabbed a menu. I've never been a big coffee drinker. For the first twenty nine years of my life I hated coffee, tea ... pretty much any hot liquid was a no go. Then I turned Thirty and something changed - my brain rewired itself into grown-up mode and I discovered that this coffee stuff ain't so bad - So I'm still relatively new when it comes to the stuff, by no means an expert, but I know what I like and the cappuccino at Hey Jude is damn delicious. Is there a combination of words in the English language sweeter than "All day breakfast"? (well yes, "open bar" comes to mind, but go with me on this one). The menu has had some retooling since our last visit. So many options I didn't know where to start, after lots of back and forth I settled on the B.L.T, while Reviewer Nikki decided on the Eggs Benedict. I noticed that there was a schnitzel on the lunch menu - Will tuck that away in the back of my mind for future reference... Here's hoping they throw some cheese, ham and napoli on top once in a while and then we'd have a more official reason to come and visit. Thats what I'm talking about - nothing worse than a B.L.T that is tight on the bacon, the Hey Jude BLT had plenty to go around. It was flavoursome, crunchy and tied in perfectly with the fresh tomato and crisp lettuce (no surprise there, there's a reason the BLT is a classic). The horseradish mayo was a great addition, I could've eaten it with a spoon, I might be getting a bit greedy but I just wish there was a little more of it on the sandwich. Reviewer Nikki went for the eggs benedict - another breakfast stalwart, and usually my go-to when it comes to breakfast - so naturally I had to steal a couple of bites (What are wives for if not to steal bites of food that you didn't get to order?). Once again they weren't tight with the pig, hollandaise either. The eggs were perfectly poached, light as air and deliciously runny throughout. There are a hell of a lot of cafes and coffee houses on Keilor Road these days, but Hey Jude is definitely one of the best. After the breakfast on the weekend I realise that I've been missing out by not travelling the extra two minutes to eat here over some of the other spots in the area. Definitely worth a shot if you're nearby, I'd say try and get in early as I don't think there's a time when Hey Jude is not busy. Oh, and if you're curious the bucks day was a rousing success as well - It's now Monday afternoon and I'm still a little hungover.